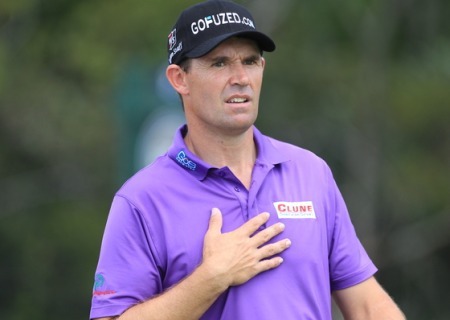 Harrington said: “I haven’t looked at qualification for a tournament in a good few years and I’m hoping to produce a bit of form so that I don’t have to start looking now. But he confessed that he may not be able to afford to turn his back on “easy” world ranking points next year. He said: “Next year could be a different story. I could then find myself chasing world ranking points, going where there were easy points on offer. “I want to be in all the important events from the start of the next Ryder Cup qualifying campaign on September 1. “I’ve got to be in the world events to get the bonus points crucial for the Ryder Cup. Harrington’s season has been a combination of bad luck and injury, sprinkled with moments of brilliance. Disqualified after an opening 65 on his seasonl debut in Abu Dhabi, he was 58th in Bahrain and turned good starts in 63rd and 55th place finishes in Pebble Beach and Los Angeles. Padraig Harrington tees off on the 15th hole during round three of the BMW PGA Championship at Wentworth, 22nd May 2010. (Photo: Eoin Clarke www.golffile.ie)He was beaten in the first round of the Accenture Match Play and then made an early triple bogey in the final round of the WGC Cadillac Championship at Doral when running second and came home tied for 10th. He missed the cut on his next outing in the Transitions Championship in Tampa but tied for eighth in the Shell Houston Open and looked good for the Masters. However, he hurt his neck swinging a training aid left handed on the range on the opening day and never had a chance to make the cut. From Augusta, he heard to China with his family but comfortably missed the cut in the Volvo China Open and spent time working with coach Bob Torrance in Dublin. On his return to action in the Wells Fargo Championship in Quail Hollow, he tied for ninth despite a bizarre, final rounds rules query. He was playing injured in Charlotte, having hurt his hamstring with knock on effects for his already delicate knee, playing chasing with his children the previous week. He admits he would have rested the following week but he decided to tee it up in the Players Championshop at Sawgrass and missed the cut comfortably again. Commenting on his stop-start year, he said: “Maybe I’m working too hard and anytime you overdo things, your body has a very good way of making you stop, as it is doing at the moment. It is my nature to over-do it. I’ve certainly over-practiced. “You know, it’s tough. There’s a lot of good events and it’s hard not to play. So ye, I’d say maybe I played a little too much and practiced a little too much. The season’s long and I only had the six weeks off during the winter. “Maybe I’m paying for not taking more time off during the winter but, again, there’s so many good events. The season’s even longer this year and it is tough but, hopefully, I come back out fresh for the three Majors and the remainder of the summer. If I win one of those, I won’t have to worry about the stop-start nature of my season. Padraig Harrington in Abu Dhabi earler this year. Picture Fran Caffrey/www.golffile.ie.“Very much so, my season has been stop start. Getting disqualified in my first event; then losing in the first round of the Match Play. If I started off tournaments well, I didn’t finish them out well. When I got some momentum in the ‘States and had some good finishes, I got injured at the Masters. Harrington used to say that he couldn’t see himself lasting into his 40s, so intense was his practice regime early in his career. Now he insists that his injuries are merely sporadic incidents and believes he will keep going for another eight years at least. He said: “I think these are sporadic incidents. Vast amounts of my training nowadays is focussed on curtailing and sorting out the damage I’ve done over the years by hitting to many balls when I would have been tired and, as a result, my posture would have been poor. Targeting a return to action in Memphis in two weeks, he said: “I would think I have to play Memphis. I wouldn’t be competitive for the US Open unless I play the St Jude Classic there. I would put up with it in Memphis and then try to find an alternative after the US Open if I have to. Harrington wants to avoid making a bad situation worse but he is about to head into the meat of the season with three majors in the space of 11 weeks on his return. “You know me, I’d play the three Majors if I was on a crutch. I’m not going to miss a Major Obviously there’s alternative ways to deal with this, like strapping it up and working with it. The key here is that we’ve got a window of opportunity to sort it out. “I put up with it [at Sawgrass] and at Quail Hollow. It can be done but it’s not the right thing to do, if you know what I mean. All it would mean is making it worse and delaying the recovery if I didn’t take a couple of weeks off. “Yes it’s a big pity not to be playing [the BMW PGA]. I’m quite keen to get out on the golf course and see my game. I’m excited by my game at the moment. There’s some very good stuff in there and I was looking forward to Wentworth. I did well there last year and the greens there can be exceptionally difficult, which would play into my hands. “It’s easier to play less when you are winning. If you’re not winning you tend to play a bit more. I’d sort out my own problems if I start winning. “I’m hitting the ball well, swinging the club well. I’ve been doing all the right things but, sometimes, I’ve pushed things a little too hard and have overdone it at times by trying too hard. “It’s hard to get a right balance. At least if things are going well on the golf course, it’s easier to do but if thing’s aren’t quite falling for you, you tend to push a little harder and do a bit more practice here and there. Hoey happy being Hoey: “I used watch Graeme or Luke Donald winning events and feel jealous. But I am over that now"